DVD Synopsis: Bela Lugosi and Boris Karloff star in this shocking horror classic of Satanism and murder. Honeymooners Joan and Peter Allison are stranded and forced to spend the night at the home of sinister Herr Poelzig (Karloff). They soon learn they are being held captive in the mausoleum and that Poelzig is the high priest at Black Mass. He has chosen Joan to be the Devil's bride. David races to save his wife from Poelzig's unspeakable treachery in the unforgettable climax. Karloff and Lugosi: you get them both in 1934's The Black Cat. 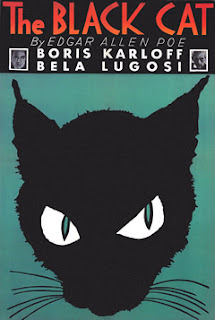 But what's even better, what makes this match-up of two of horror's most iconic performers truly noteworthy is that, with it's tale of lost love and revenge, The Black Cat ultimately delivers Karloff vs. Lugosi! Lugosi is Dr. Vitus Werdegast, a former soldier who just spent 15 years in prison following his capture in World War I, and Karloff is Hjalmar Poelzig, an architect who was not only directly responsible for Werdegast's incarceration, but who also seduced the good doctor's wife and daughter. The two square off in Poelzig's strange mansion, which was built on the site of one of the war's bloodiest battles. The story is an engaging one, and provides the two legendary stars with everything they require to make The Black Cat a memorable horror film. Lugosi has always been an actor with a flair for the spectacular, and I absolutely love watching him perform. In The Black Cat, he's his usual hypnotic self, delivering his lines as if every single one of them were of the gravest importance (When relating the story of his time in Kurgaal prison, he says, ever so dramatically, “Many men have died there” (dramatic pause) “Few have returned” (slightly longer dramatic pause) “I have returned”). His theatrical approach to the role extends well beyond the delivery of his lines; in one scene, Lugosi shrinks in horror at the sight of a black cat, falling backwards and covering his face, as if the sight of this animal had wounded him to his very soul. Karloff is more subdued in his performance, yet is, at the same time, much more diabolical than his equally famous counterpart. In fact, I'd categorize his Hjalmar Poelzig is evil personified. Along with his penchant for black cats, there's the fact that he collects the bodies of deceased women, which he preserves and then displays in glass cabinets, so that he might forever admire their beauty. And if that's not enough to chill your blood, Poelzig is also the high priest of a devil-worshiping cult. Whereas Lugosi is the more flamboyant of the two, it's Karloff who brings the true terror of this story to the surface. There are a few other characters who pop up from time to time throughout The Black Cat, including a pair of newlyweds (played by David Manners and Jacqueline Wells) who are along for the ride, but they remain neatly in the background. The Black Cat is a movie that belongs to two legends, and it's story, which twists in all the right ways, provides them both with ample opportunity to shine. I watched the Black Cat via the free link on Planet Macabre, I liked it, I really like the oldtime movies they dont make them like that anymore and they are short like a hour or so. Dr. do you think the Lugosi Collection is worth it? The other 4 movies are they good? i love the podcast your apart of, do you know how i can save the black cat (excellent movie) and make a dvd out of it using the youtube version? Thanks for the comments, and for checking out the blog. @Derek: Glad you enjoyed THE BLACK CAT. It's one I really like as well. Honestly, I didn't catch all the films on the Lugosi set, but he's such a charismatic actor, and always so interesting to watch, that I'm confident the set is well worth the money. Heard the #4 Pod and liked it so much I went back and to my surprise found out this is your first time podding. You sound like a seasoned pro and I like your style. Your blog here is nice, much content. I will be reading for hours. @Steve: Thank you so much for the compliment. I do enjoy recording the Podcast, and am thrilled to be a part of it. But I have to say...that first show, I was nervous as hell (I'm glad it didn't show). Thanks again for checking out the blog. I appreciate it. Hello, and thanks for taking the time to comment, and visit my site. @Simon: I couldn't agree more. A lot of times, the classic horror films (which, over time, have admittedly lost their power to frighten) are often forgotten about. I'm thrilled to have a chance to throw a spotlight back on them doing the Planet Macabre Podcast. As for the 2500 number, I do own quite a large number of DVDs, and it did play a factor in choosing such a high quantity to watch. @Justine: Hello from PA, your neighbor to the west (or north, depending on which part of NJ you reside in). Thanks for stopping by, and I'll keep as sane as I possibly can! Enjoyable Podcast and your reviews, specifically of the silent era. Hard to find fellas like myself that enjoy that. @Archie: Thanks for the comment! Thanks also for checking out the Planet Macabre Podcast. I'm glad you're enjoying it. And yes, I'm definitely a fan of silent horror films, but also silent films in general. You are not alone! I'm with you and billchete mirrors 2 sux I just wish I would of heard the podcast be4 buying it! I will check out black cat sounds pretty good. BTW I been browsing your blog and on the very bottom I think you have a problem widget saying gadget configured improperly. Nice blog. Hello, and thanks for the comment! Yeah, I just couldn't get into MIRRORS 2, especially after really, REALLY enjoying the first MIRRORS. Sorry we couldn't get to you in time to save you a little money! And thanks for letting me know about the problem at the bottom of the page. It's been an on-and-off issue for some time, but I've finally given up on it and removed it from the site. Thanks for listening, and take care!